Take fresh fruit. Crisp apples eaten bite after bite on the street, a quick snack to tuck in your bag, a freedom statement I’ve proudly embraced since I used to have an apple as mid-morning snack at school. Sun ripened peaches praying to be devoured, soft velvety skin, a dense pulp and warm juices running down your bare arms. Watermelon slices to hide yourself behind during the hottest summer days in search of refreshment. Sugary persimmons in a porcelain dish, a dessert for winter afternoons. Fresh fruit has sensuality, it exerts an irresistible call on all our senses. Then you have cooked fruit. It often loses this passionate allure to turn into a second choice, it becomes a last-minute solution to avoid throwing a wilted apple. I completely changed my mind when I stumbled upon this article, The Hidden Pleasures of Compote, on the National Geographic. Stewed fruit, roasted fruit, compotes, they can be just as sensual as fresh seasonal fruit. Depending on the occasion it acquires an adult and thoughtful taste or falls in the reassuring category of comfort food, going to compete with a cup of hot chocolate. Take prunes, for example. For the collective imagination prunes remind grandmothers, dusty old time cupboards, a fruit that became almost a medicine. Yet right now, sitting at my kitchen table as I write to tell you this new recipe, I’m munching on a prune, the third, to be true. I find them irresistible, they have an adult and deep taste, they remind me of jam and chocolate. This month I received a nice package of Sunsweet prunes to use in my recipes: California prunes are the best on the market, a carefree treat, juicy and soft. They are produced following a long and accurate process aiming to preserve their quality. You can easily recognize them from their donut shape. I used them to roast a pork loin and make an arista, one of my signature dishes. I learnt to cook meat with the classic arista alla fiorentina, a cornerstone of the Tuscan tradition that roots back its history to the florid years of the Florentine Renaissance. Once you are familiar with this cut of meat, you can easily adapt the recipe to seasonal ingredients and cooking methods: from fresh herbs for your Sunday roast to apples for an Autumn favourite. Pork and prunes is a long time tested and approved match which is always welcomed by everyone, even by the most doubtful and by those who do not tend to mix fruit and meat together, my mum to name one. 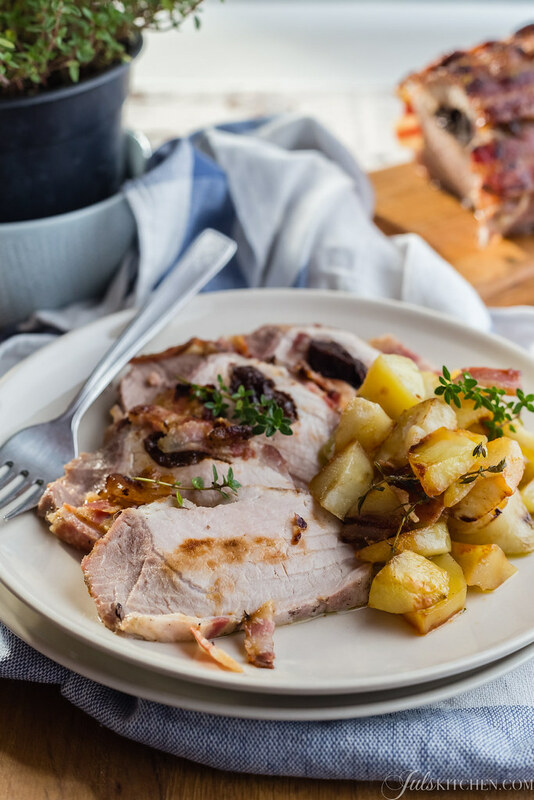 The prune sweetness is softened by the pancetta that wraps the pork loin, but at the same time is also enhanced by the honey which glazes the roasted meat. Mum approved the recipe and asked for a second serving, I bet that even the most hard to please friend will lick the plate clean. Arrange the pork on a cutting board and make a longitudinal incision from side to side with a sharp knife: all you have to do is to create a pocket you can stuff with prunes. 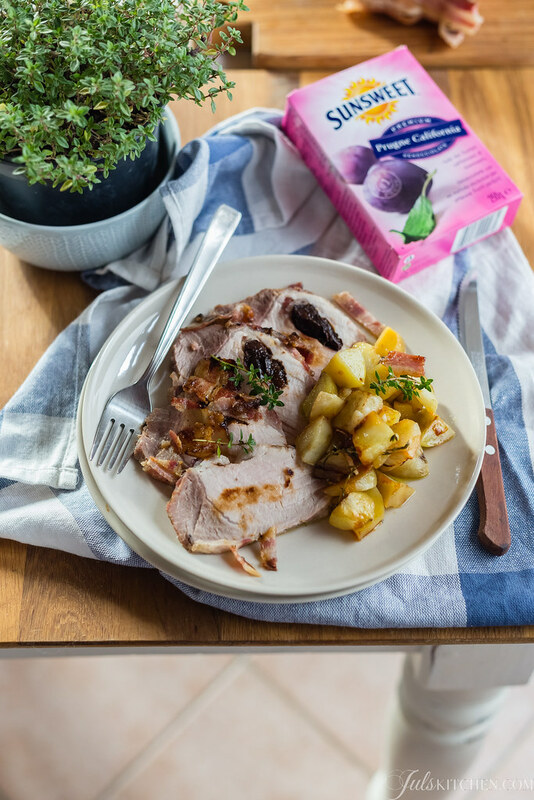 Tuck prunes and a chopped slice of pancetta into the pocket. Cover the pork loin with slices of bacon, lining them lengthwise all around your piece of meat. Add a few sprigs of fresh thyme and tie the pork with a butcher’s twine. Pour a few tablespoons of olive oil on a baking dish and arrange the pork in the centre. Scatter the peeled and chopped potatoes all around the pork loin. Drizzle the potatoes with olive oil and season with sea salt and thyme. 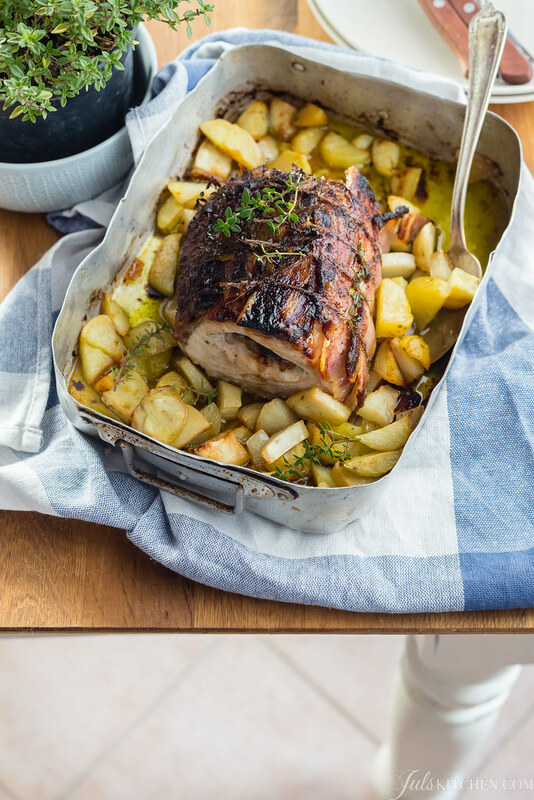 Season the pork with one tablespoon of olive oil, then drizzle with a tablespoon of runny honey. Preheat oven to 220°C (gas mark 7, 425°F) and roast the for about 30 minutes, basting occasionally with juices from the pan. After half an hour lower the oven temperature to 180°C (gas mark 4, 350°F) and roast the pork for 10 - 15 more minutes. 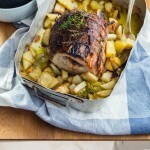 Remove the pork from the oven and wrap it for about half an hour in aluminum foil before serving. This little trick will complete the cooking, leaving the meat soft and juicy. Italian cuisine is the most complex and balanced, this delicious recipe example. Write to info@julskitchen.com for questions, cooking class inquiries, foodie recommendations on Tuscany, collabs or suggestions! You'll get a free eCookbook with our top 20 most loved recipes too! From the Markets of Tuscany. A cookbook. Our 5th cookbook, finally available in English! 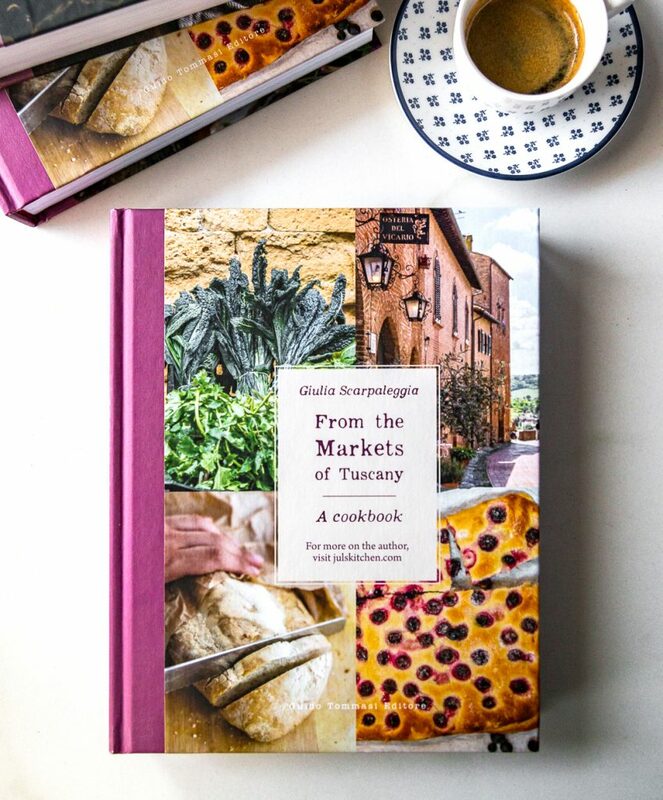 This book is a collection of traditional and seasonal recipes and a guide to the best food markets in Tuscany. Read more on the blog. Order now on Amazon (worldwide). Have you made one of our recipes? If you make one of our recipes, snap a pic and hashtag it #myseasonaltable. We love to see your creations on Instagram, Facebook, & Twitter!Join the fun of our Facebook Group Cooking with Juls’ Kitchen, too.